ICSPA Virus is a term to refer to the latest ransomware infections which have been recently detected by malware researchers. 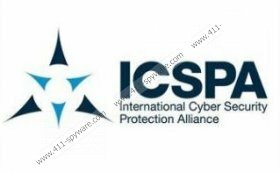 The letters ICSPA stand for International Cyber Security Protection Alliance whose logo is present in almost every message displayed by a Trojan horse called Urausy. There were other ransomware infections associated with the Urausy Trojan, including Cybercrime Investigation Department Virus, GVU virus, Poliisi virus, and so on. Their major goal of these threats is to convince you that the police or other authoritative institution wants to impose a fine of a particular sum of money on you. The same goes for the newest release of computer infections, some of which are FBI Cybercrime Division Virus and United Kingdom Police Virus. All these infections, or rather their interfaces, cannot be trusted because all the credentials of authoritative institutions are presented to trick you into paying money via Paysafecard, MoneyPak, or Ukash, which depends on the country you live in. If your computer is infected with ICSPA Virus, it is likely that you live in Australia, Canada, Ireland, or UK. Do not panic if you cannot access the computer as you can regain access to the system by removing ICSPA Virus from the system. Do not pay the release fee, which may vary depending on the currency of your country, and ignore the accusations that are pretty much the same in every hoax message. If your computer is paralyzed by ICSPA Virus and you see that it contains the credentials of your local police, you can always contact them and find out whether you are charged with the use or distribution of copyrighted or pornographic material. You may also find that European Cybercrime Center, whose logo is added into the misleading message, is presented as a part of the issue. There is now legal institution which would attempt to violate your privacy and get to your PC without your consent in order to provide you with accusations, so do not be afraid of taking some actions and remove ICSPA Virus right now. If you do not know how to remove ICSPA Virus and where to start from, follow our instruction which will show you how to delete the threat using our automatic spyware removal tool. Start tapping the F8 key once the BIOS screen disappears. Run the installer and scan the PC afterwards. Run the installer and then remove ICSPA Virus. 1. Restart your PC and start pressing F8 key after BIOS screen. 3. You will see Command prompt Window. 4. Type in explorer.exe and hit Enter. Desktop Should load. Followed instructions; entered explorer.exe it came up briefly and then the window returned to display ICSPA page.